Rising waters keep roads around Wilmington and across coastal North Carolina closed Monday, four days after Hurricane Florence made landfall. JACKSONVILLE, Fla. - From the very start, tropical cyclone Florence behaved differently than other systems, and it is finishing as a groundbreaking flood machine that’s altered the record books. News4Jax photographer and Weather Authority storm chaser Matt Kinzig, went to Wilmington, North Carolina, last week to cover the storm and now can't get out, as the city is surrounded by rising floodwaters. Kinzig said people are fearing the river will swell and that washed out roads have left people no way to escape. Florence broke the mold becoming the first storm to strike the mid-Atlantic coast from such a unique spot so far out at sea during the first week in September. 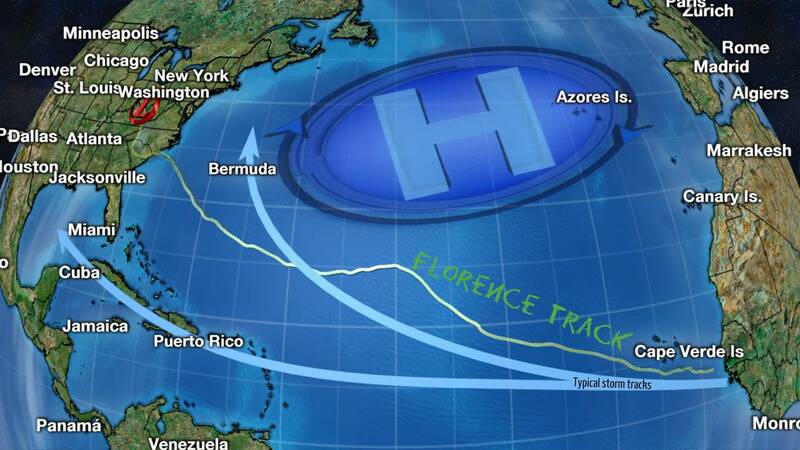 The hurricane developed in a spot in the eastern Atlantic that typically sends storms on a track out to the open ocean with little impact to the United States. Sure, many hurricanes develop in September since it is the peak of hurricane season, but most curve around the Bermuda-Azores high or rip across the Caribbean Sea. Far eastern Atlantic hurricanes move on two primary tracks around the Bermuda High with strikes in the Carolinas being less common. The unwavering ridge directed Florence on a laser-guided path to Wilmington, with hardly any change to the track more than a week out from the catastrophic flood event. Eventually, the steering push ended and the storm nearly stopped. 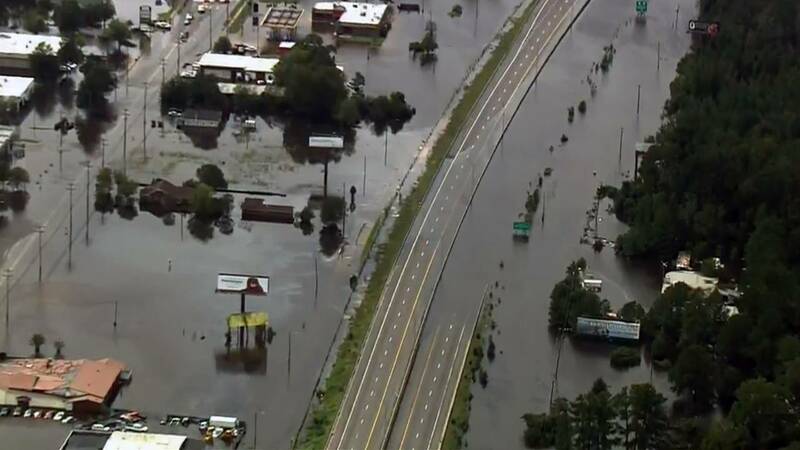 The painful crawl over the weekend toward Columbia, South Carolina, resulted in a statewide crisis for North Carolina as more than 30 inches of rain targeted towns like Swansboro. Day and night, feeder bands trained over both coastal and inland areas setting all-time records for the most rainfall from any tropical storm or hurricane in North Carolina. Kinzig said even areas in Hurricane Matthew that didn't flood are flooding now. The rain turned Wilmington’s peninsula into an island and cut off supplies for people who didn't evacuate. Without fuel, the areas public water utility risked becoming contaminated and other life-sustaining activities are in jeopardy. Crews are working hard to restore power remove debris and assess damage. The sun came out Monday, helping the resilient people's mood, but patience is running low as they wait out the situation.